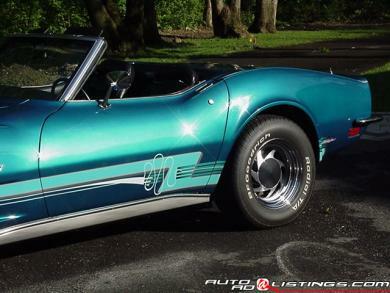 This is a fine example of an early 70�s Corvette. This car is mildly customized with paint, tires, wheels and some chrome under the hood. All else is stock. The short block has been replaced by a factory late model version and runs perfectly. Options include factory air conditioning, AM/FM and power windows. There is an after market (ON/OFF) battery security switch as well. This head turning driver has never seen rain or snow and has been stored in a climate controlled atmosphere. Always covered and kept out of harms way by one owner over the last 10 years.